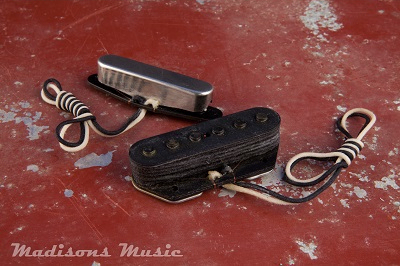 Crystal Clear Pickups '52 Inspired blackguard pickup set. The blackguard is by far one of the most recognizable guitars in history. Known for there clean natural tone and simple design, Our '50's Telecaster pickups are a perfect example of this. Hand wound vintage style black bobbins with alnico 3 magnets. The bridge pickup offers that signature spanky tone with clear defined highs and very punchy midrange. The neck pickup has very clear un compressed low end complimenting the bridge pickup beautifully! Together the simplicity and natural bell like tones are very evident!